What skin conditions can benefit from microneedling? Scars due to other skin conditions. Aged and sun damaged skin. Facial and décolleté lines and wrinkles. Microneedling works by stimulating the production of collagen and elastin; the key building blocks of healthy skin. Derma roller: A typical dermaroller has 192 needles; the roller is rolled about 6 to 8 times (back and forth in three directions) over the target area. This will lead to over a thousand needle entries, all of which will act to stimulate new collagen fibres. This will increase the skins thickness and improve the appearance of any scarring, wrinkles and damaged skin due to aging. Derma stamp/ Dermapen: This is one of the most effective microneedling techniques. It works by stamping the skin with microneedles that are contained in a disposable head. The depth of the needles is controlled by the Derma Stamp Pen and can be adjusted from 0.1 to 2.5 mm. The microneedles pierces deep into the skin, creating micro injuries and trigger the stimulation of collagen. Derma stamping also increases skin thickness and improves the appearance of any scarring, wrinkles and damaged skin due to aging. In comparison to the Derma Roller, Derma Stamp typically produces superior levels of skin rejuvenation. Additional benefits of this procedure are that the depths of the needles can be varied for different treatment areas and that generally the procedure is considered less painful than Derma roller. Microneedling using Derma Stamp/Derma Pen and Derma roller is usually well tolerated but some clients may find it uncomfortable. We will numb your face with local anaesthetic for approximately 45 minutes before performing the procedure to minimise any discomfort. In addition to stimulating collagen growth, micro needling also enables substances applied to the skins surface (such as topical treatments) to be absorbed more efficiently, considerably increasing their effectiveness. Microneedling can also be used to improve the appearance of cellulite. What are the advantages of professional skin needling treatment at Bedford Skin Clinic? The procedure will be performed by a doctor who is a specialist in the field of aesthetic medicine. There is no visible damage to the skin. We can treat any part of the body. It is relatively cheaper and can be as effective as expensive laser treatments. Skin becomes thicker, tighter and more youthful in its appearance. It can increase the effectiveness of topical skin care products. How effective is Microneedling treatment? 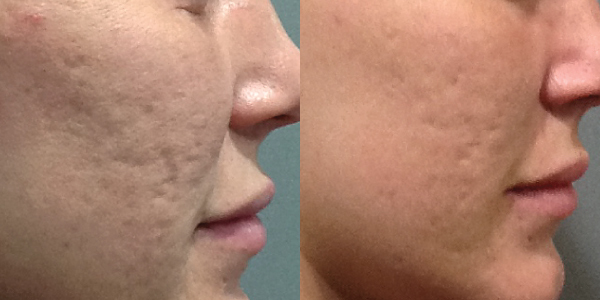 Microneedling is a form of treatment for wrinkles, stretch marks, depressed scars (including acne scars) and cellulite. The results vary between individuals, with factors such as age, needle length, diet and general well-being influencing treatment outcomes. Overall microneedling typically produces impressive results for the majority of clients. Repeat treatments may be required to produce optimal results. When is Microneedling treatment not suitable? The treated area looks red/sunburnt for a few days. There is no or minimal discomfort after the procedure. Clients can get back to normal activity on the same day. We strongly recommend the regular use of SPF50 after this treatment.